A pretty cool heist movie that combines the story of the cops with that of the robbers in a way that hasn’t really been done since Heat. A very entertaining film, this one is right up there with Heat and the Town as one of the better heist movies. Like Heat, it is about a group of high end robbers, but also a number of cops who are pursuing them. The movie starts out generic (a bank robbery,) but then expands to become more about the characters and relationships than it is about the actual jobs. And there are some pretty dysfunctional relationships here, including a crime boss who is holding the son of one of her workers hostage and a cop who sets up his partner to be murdered. This is some pretty dark and twisted stuff, and it really keeps you on the edge of your seat. The heist cops and robbers movie is a genre that just doesn’t get explored as often as you might think. Not by big mainstream movies, anyway. There was Heat in the 90s, The Town in 2010, and now Triple 9 in 2016. But that’s really about it. And all three films are pretty good. Triple 9 is the weakest of the three, but that’s only because the list is composed of such high caliber pictures. I suppose the genre goes all the way back to something like The Killing, by Stanley Kubrick, about a racetrack heist, and the Getaway with Steve McQueen. But these days we don’t see a whole lot of it, and that’s a good thing, because it means the market on these films is full of ripe opportunity. The result seems to be that they all turn out pretty good. 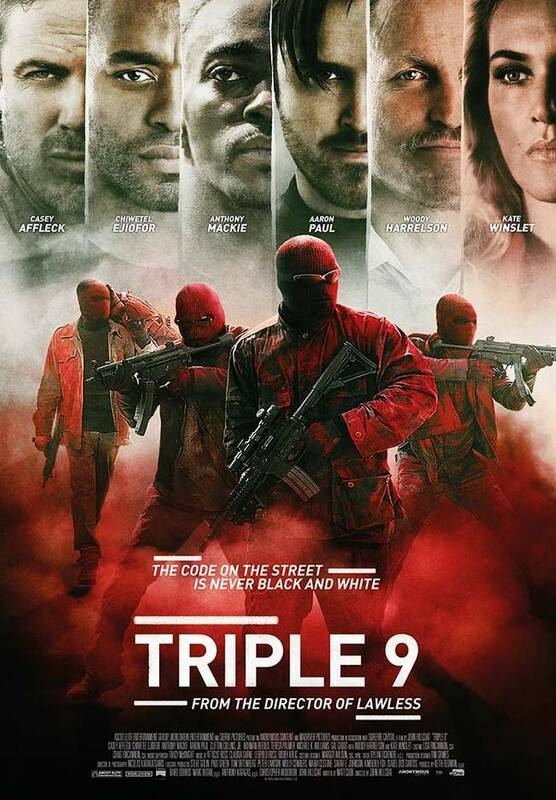 Like Heat, Triple 9 is very much about watching both the cops and robbers for about an equal amount of time. Both films are ensemble pieces where you’re not even sure who the main character is, or if there really is one at all. Now that’s something The Town didn’t do, giving us one lead robber (the Ben Affleck character,) and also presenting only the robber’s point of view, and not that of the cops. The Town also featured a romantic subplot. Heat kind of did too. Not so with Triple 9. The only thing that even comes close is the relationship between MIchael, (Chiwetel Egiofor,) and Elena, (Gal Gadot,) which once was strong, but is now so dysfunctional that Elena’s sister, Irina (Kate Winslet,) is holding Michael’s kid hostage from him, to get him to do jobs for her. Thats the the kind of movie this is. Dark and gritty and packed to the brim with back-story. And this back-story is actually one of the coolest things about the movie. There’s so much history between these characters that we don’t know about, or are not told right up-front, that we have to put lots of pieces together and connect all the dots ourselves. Trying to figure out how all these characters know each other, what the connections are, and what might have happened to these characters in their former lives, turns out to be a lot of fun. You just need to pay attention. Michael and Russell don’t really like or trust those other guys. We can tell that Gabe is the black sheep, younger brother of the group, and that Russell and Michael, the older and wiser guys, know each other from the military. Franco and Marcus are cops. Gabe used to be a cop, and that’s how he knows those two guys. Got all that? It’s a lot, and it isn’t given to us all at once, which is a smart move. And even if you don’t follow how all these guys know each other, it’s okay, and makes very little difference to the plot. But if you can put all the pieces together, and care to try, the string of connections turns out to be pretty cool. We join all five robbers as they pull of a bank heist. These guys wear black ski masks and sunglasses over their eyes. They bring pictures of the bank managers house and kids to use as threats, in order to get him to open the vault. The robbers are there to steal one security box from the vault for Irina, but Gabe gets greedy and snatches up a money bag as well. During the crew’s getaway, the bag explodes pink paint in their van, causing a problem on the highway for the crew. If the bank vault scene was nothing special or memorable, (it is very similar to the opening scene of the Town, and doesn’t do a whole lot to differentiate itself,) then this highway scene is where the movie first comes to life. This is pretty cool stuff, and it ends with the guys meeting up in a garage and blowing up two vehicles (the one they left the robbery in, and the one they switched to, when they stole it from a driver on the highway.) The guys are not so happy with Gabe, for taking that exploding money bag from the bank. Now we meet the police detectives. Two of them we already know. Marcus and Franco. Those are the dirty ones who are in the crew. But then there’s Jeffrey Allen, (Woody Harrelson,) the lead detective, and his nephew Chris, who is a fresh face, just joining a new task force. He gets partnered up with Marcus, and Marcus is not happy. He can tell that Chris is one of the good ones, and a boy scout, and that there will be no turning him to the dark side. Chris instantly becomes a major character in the movie, and might even be considered the lead of the film by the end, but I love how this movie spends a whole lot of time with the bad guys before we even get anywhere meeting Chris. Irina wants another job done, and this one is the big time. She wants them to steal something from the Department of Homeland Security. The only way the guys think they have a chance at doing something like that is if a cop goes down on the other side of town. As cops themselves, they know that when a cop is killed, a triple 9 is called in (the police code for this,) and all cops anywhere within reach flood to the scene. If homeland is going to be burglarized, then the best bet is to make sure all the cops in the town are as far away as possible. So that becomes the plan. And Chris, the partner of Marcus, becomes the target. He’s the cop who they are going to kill in order to use him as bait to lure the other cops away. Now, we get two fantastic set pieces. 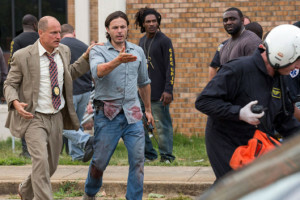 The first is a projects police shootout scene, where a suspect is on the loose and Chris leads the way to capturing him. There are some fantastic tracking shots here, through stairwells, dark room, and narrow hallways. And after this scene, there’s the one where Chris is called into a deserted area, very far away from everything else, in order to capture a suspect. This is the scene where the plan is meant to go down. And all of this comes before the Homeland Security break-in, which is a fantastic scene as well. All of this is incredibly thrilling. 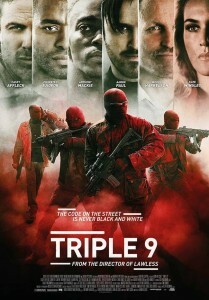 Triple 9 is a great movie. It has a really clever story with some nice twists. The action and characters are also pretty entertaining. This is the kind of movie that leaves you wanting more. We want to know more about these characters and who they are. Take Elena, for example. We learn so little about her relationship with her sister and how she is okay with Irina holding their son. And that’s what makes the dynamic between all these characters so scary. This movie knows that the less it tells us, the more curious and haunted by the whole situation we are. The team of robbers story is fantastic. And the way the movie presents both sides of the coin, giving us likable characters in both the cops and the robbers organization is also great. There really hasn’t been a movie so evenly on both sides of the fence like this since Heat, and to be in the same ballpark as that film is quite an accomplishment.